Seminar Topic: Ozone: A Protector or Pollutant. Ozone is a pale blue gas, made up of three oxygen atoms rather than the usual two oxygen atoms. Ozone can be both "good" or "bad" for human and the environment, according to its location in the atmosphere. The ozone layer in the earth atmosphere is made up of ozone. It is a very important layer which protects everything on the earth's surface from the sun's harmful ultraviolet rays. But when ozone occurs at the surface it becomes a pollutant itself, and hazardous for forests, crops and human beings. 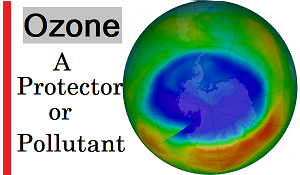 In this seminar report, we have discussed the harmful effects of ozone hole formation and the ozone as a protector through an experiment. Ozon acts as a pollutant in the biosphere and as protector gas in the stratosphere. Harmful UV-B entering through the depleted ozone layer (ozone hole) is damaging the health of mankind, reducing the food, vegetable & fish production, altering the ecosystem function & balance and causing huge monetary losses. From this realization, therefore, massive global efforts have to be initiated. The problem is global. Rich and poor men alike are being affected with least concern for geographical boundaries. Therefore, all nations have to join in the common endeavor of conservation of ozone and prevention of UV-B enhancement.